“Some are destined to stay behind, some are destined to depart, and yet others to arrive. The metaphysical truth that binds the five overlapping narratives that tell this story of one German woman’s life is simple: A day on which a life comes to an end is still far from the end of days. Like waves crashing upon the shore and retreating again, in each section of this mesmerizing novel by German author Jenny Erpenbeck, the unnamed female character at its centre dies. Born in Galicia, in 1902, to a Jewish mother and a Christian father, the first section imagines her dying before her first birthday. While her mother sits shiva, her father escapes to America in his grief and the young family never recovers. But then, the narrator steps in and asks us to reconsider the possibility that the infant’s life might have been saved and that another fate unfolds. Now, a second daughter follows the first and the father relocates his family to Vienna in hopes of improving his ability to support his wife and daughters. But war breaks out and life is cold, unimaginably cold, and meagre provisions are meted out to the hungry residents who line up each night, through the night, clutching their ration cards. As her father obsessively copies out earthquake reports brought home from his work in the department of meteorology and her mother assumes she is leading a questionable life, our heroine is simply in her late teens, trying to understand all of the normal passions of adolescence in an atmosphere that seems to hold out little hope. This time she will lose hope and conspire to take her own life. In her third incarnation we find her in Moscow, having aligned herself with the Communists and trying to write and re-write her own story in a desperate attempt to save herself and, if possible, her husband who has already been arrested. This central section, the longest and densest, forms the axis upon which 20th century European history and the life of the woman at the heart of The End of Days seems to turn. Her own allegiances are complicated, everything she had believed in is tested, and the ground shifts so quickly that holding fast to moral or political ideals is like, well, surviving an earthquake. Her fate, like so many of her relatives is seemingly inescapable. 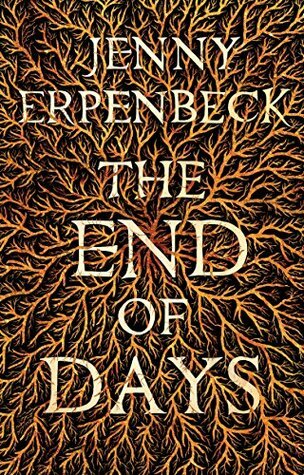 As well as being a writer, Erpenbeck is also an opera director; and the hypnotic, haunting images and motifs that arise, disappear, and resurface throughout this exquisite novel are reminiscent of the phrases that are repeated and built upon in an extended piece of classic music. The mood is mournful, as themes of loss and the experience of death and grief are revisited, each time within vastly different contexts. Susan Bernofsky’s deft translation sustains the rhythm and music of the language. In the hands of a lesser writer this would seem contrived, but here, the bones are bare, the emotions raw and the result heartbreaking, horrifying and beautiful in its sheer humanity. The prose is spare, evocative. It gets under the skin, works its way right into the reader’s heart. I could say so much more, but quite honestly, this book deserves to be experienced not described. International Foreign Fiction Prize 2015: I finished this book on the eve of the announcement of the IFFP long list and I am thrilled to see it included. (Published by Portebello in the UK, I have the New Directions edition.) I feel confident that it will be one of my personal top reads of the year and I will be looking to read more of Erpenbeck’s earlier work in the future. Am pretty new to reading translated fiction and I’ve loved what I’ve read so far but it is praise indeed to say this is a book to be experienced! I will definitely add it to my list and look forward to it. I am reading with the IFFP shadow jury this year and I had to get my thoughts out on this amazing book before moving on. The remaining 13 books I still have to read (help!) will have a high bar to clear to surpass this one for me. But who knows. I am looking forward to discovering a few more treasures along the way. Well haaaaaalejujah – I read your review and, as with almost all of them, developed instant book envy and a need to read. I leopard crawled sneakily over to my favourite shadowy and unethical corner of the internet and for the second time since I started reading you, the book was there. You really are a damn fine reviewer btw. This is such a damn fine book, it was easy. It will be harder when I have to review something I don’t like. This sounds great. I will have to see if my library has it! In N America it is published by New Directions. It was too gorgeous to leave on the bookshelf and I never buy hardcovers. I had heard so much good about her though so no regrets. I had to get this review out before tackling any of the other listed books. It is most wonderful. Great review – your enthusiasm for the book shines through. It does sound excellent. Sadly, my local library network doesn’t possess a copy of this one (I may have to place a request at some stage!). in the meantime, I might try Erpenbeck’s earlier novel, Visitation. Looking forward to following your IFFP posts. I heard some great talk about Visitation from readers I admire, but I decided to go ahead with this one hoping it would make the IFFP list. I even bought the hardcover (New Directions here in Canada) and it was no more than many trade paperbacks. It was also too beautiful to resist and in my enthusiasm I have penciled through my copy. Do be sure to check out her work, it is very special. Thanks for the retweets (I am new to twitter). I have one other IFFP review ready (Murakami) but I am decidedly less enthusiastic about that one. I’m glad you enjoyed this – I, too, suspect it will be among my books of the year. Having read all of her previous novels (in English), I would recommend each and every one of them! Somehow, I found scads of words for books I feel mediocre about, and for this spectacular one I could not say what I wanted. What I meant. You’re right, it needs to be experienced. Thanks, it is impossible to do the book justice. My copy is well marked up (pencil but I have no intention of parting with this) and I took pages of notes while reading and it was still hard to distill the awe and power of the work. And I knew I had to get a review out of my system before moving on so I wrote this up as soon as the long list was announced. You assuage my discomfort over my review with “it’s impossible to do this book justice.” Agreed. Like you I am on to F now. 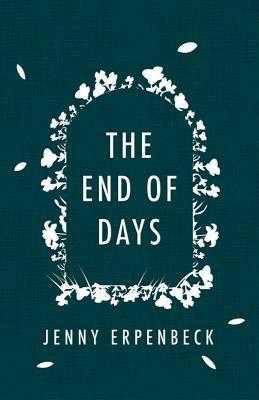 Don’t think we’ll have the same problem with this one, not that it might not be good, but End of Days is extraordinary from page one. Thank you. I love reading literature from other cultures and countries. This is a beautiful book that really brings the experience of one woman over the course of 20th century Europe to life… I wonderful a way to learn.